While reading a book about Tolkien this week, I came across the fact that parts of Lord of the Rings were inspired by Macbeth. * Which I’d already known, and was super-obvious to me, especially in Eowyn’s most famous scene. But what I didn’t realize was how much of Lord of the Rings was a direct “take that!” to Shakespeare. 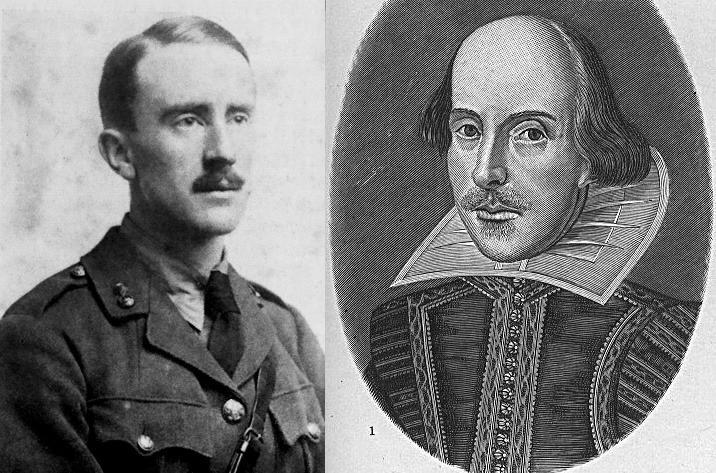 Tolkien “rather enjoyed voicing the ultimate Englishman’s heresy of hating Shakespeare altogether.” Yay, Tolkien, join the club! But Macbeth dies due to a loophole in his prophecy – apparently a man born by C-section is not born of a woman (No, I don’t get this either). Tolkien thought that was lame, and made his witch-king die at the hands of a woman. This seems like the more obvious loophole to me, maybe because I’m female. The prophecy part is the part I already knew. But I didn’t know how the witch-king explicitly paralleled Macbeth in other ways, mostly because I never paid much attention to Macbeth. The witch-king sold his soul in exchange for earthly power, while Macbeth gives in to evil in exchange for his power. So they’re both supposed to be the archetype of kings with doomed, remorseless souls. Is it just me, or is the Witch-King a bit more menacing? Maybe because I don’t need at least ten minutes to figure out what’s he’s saying? Tolkien loved this line in Shakespeare: “Macbeth shall never vanquished be until Great Birnam Wood to high Dunsinane Hill shall come against him.” He loved the thought of marching trees. However, Shakespeare had other ideas. He just makes an army cut down tree branches so they look like a marching wood. Tolkien thought this was rubbish and invented Ents. And the march of the Huorns on the orcs at Helm’s Deep. Great scenes – glad Shakespeare spurred him to write those. So yeah, Shakespeare was a relatively minor element of inspiration for Tolkien, but he did inspire some rather cool scenes! I love how Shakespeare inspired Tolkien to do the exact opposite with his plots, rather than slavishly copy him. That’s what they call “negative inspiration,” folks! For another book that uses Macbeth to enrich the story, check out Cat Among the Pigeons, by Agatha Christie. Very different from Lord of the Rings, but still good! *This book is Tolkien’s Ring, by David Day. He seems to have studied Tolkien quite a bit, so let’s hope this is a good source for extra Tolkien info! Looking for a good fantasy story that includes a few more female characters than Tolkien’s? How about one where a reluctant flower girl finds herself on a series of adventures struggling against a dangerous enemy? Then check out my book, Why Polly?, available in convenient ebook format now. And thanks for stopping by!